I notice that my Cessna 182 ( from aircraft list on Flightgear 2018.1) has nose wheel chock that doesn't disappear ,when clicked, although the main wheel chocks are removed OK on request. I have overcome this by turning the wheel hard left and increasing throttle to bump over the chock. Am I missing something or is this normal, or just a minor bug that may be fixed at some point? It's brilliant airplane. Have I not got the latest version? You might also need to click either the wheel OR the chocks, maybe you are clicking one of them and you have to click the other? It's indeed such a weird behavior that we can't click on something if the camera is below the ground but on the other hand clicks go through a plane's fuselage so you are able to click on a cockpit switch from the outside view. 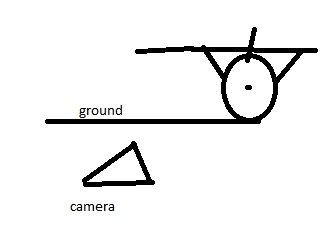 The ground thing can really be considered a bug IMO as there are many clickspots that are much easier to be reached when the camera is low, e.g. fuel sumps in the c172p, potentially chocks and tie downs, etc. Not having given it too much thought, but there probably should be a clipping boundary switch that will limit you from going below ground level. I always thought it odd that by default you could go below ground level. I really can see no purpose for it other than in water. Even then your not technically below ground. Limiting the use to go below the ground is an option, of course, I think you often find both options available in 3D games. One can argue that not going below ground feels 'realistic', but then again life doesn't have a chase cam, so personally I think either way is fine. For me, the main thing to avoid this problem the OP reported would be to consider the ground as invisible when it comes to clicks, similarly to what I described of how our fuselages work. I myself had hit my head against the wall for a long time trying to understand why the chock logic was 'wrong' when I implemented it until I figured out it was because of the camera position.